New York Times columnist Nicholas Kristof is facing criticism after retweeting a controversial message that referred to the American Israel Public Affairs Committee and the National Rifle Association as "the 2 most pig like lobbies" in America. Longtime Israel critic M.J. Rosenberg, who was dumped by the liberal Media Matters for America for his use of borderline anti-Semitic language, authored the controversial tweet Wednesday afternoon. It called to mind recently unearthed statements by Egyptian President Mohamed Morsi that referred to Jews as "pigs." "OBAMA told the 2 most pig like lobbies, AIPAC & NRA, to drop dead in same month. Next: Chamber of Commerce," Rosenberg wrote. The missive was then retweeted by Kristof and a slew of others. Rosenberg regularly engages in anti-Israel activism on Twitter and has repeatedly used the term "Israel firster," a phrase with origins in the white supremacist movement that many consider anti-Semitic. One official with a Jewish organization told the Free Beacon that Kristof’s repetition of such rhetoric is surprising given that it occurred on the same day that the New York Times ran an editorial in its print edition against Morsi’s anti-Semitic remarks. "It is quite extraordinary that on the same day the Times decries Morsi’s description of Jews as pigs, one of their premier columnists invokes the same language about a Jewish organization," the activist told the Free Beacon. The Times on Wednesday referred to Morsi’s contention that Jewish people are the descendants of "apes and pigs" as "repulsive." Another pro-Israel activist who asked to remain anonymous said Kristof is helping to promote anti-Semitic slurs. "Given that Rosenberg regularly deploys rhetoric associated with neo-Nazis and classic Jew hatred, engaging in what has been described by the Simon Wiesenthal Center as ‘toxic anti-Jewish prejudice,’ it is shocking to see a New York Times journalist promoting his ideas," said the Jewish leader. "If Father Coughlin were on Twitter, would it be OK for NYT employees to be promoting his sermons, too? Perhaps Mr. Kristof is unaware of what he is doing?" asked the source. Kristof and a New York Times communications official did not respond to a Free Beacon request for comment. 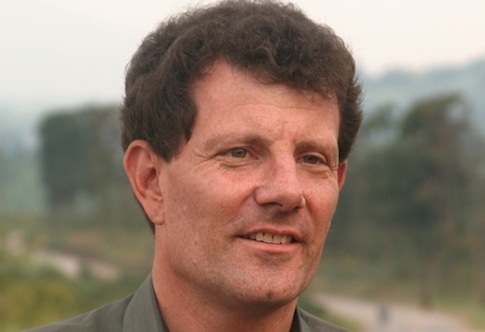 Kristof has faced criticism in the past for his writings and musings about Israel. He repeatedly has blamed Israel for the impasse in the peace process and maintains that the Jewish state’s security measures are callously aimed at oppressing the Palestinian people. Nor is this the first time Kristof has taken heat for tweeting about Israel. Commentary magazine noted last year that Kristof authored several offensive comments about the Jewish state as it celebrated its independence day, which is referred to by Palestinians as Nakba Day, or the day of "catastrophe." "Do I have this right? Israeli forces fired today on protesters at 3 different borders—Gaza, Syria and Lebanon?" he tweeted at the time. "Pres. Assad must be so relieved that Israel shot Syrians at the border, distracting from his own shootings of Syrians," he tweeted hours later. This entry was posted in National Security and tagged Israel, Media, Middle East, Twitter. Bookmark the permalink.